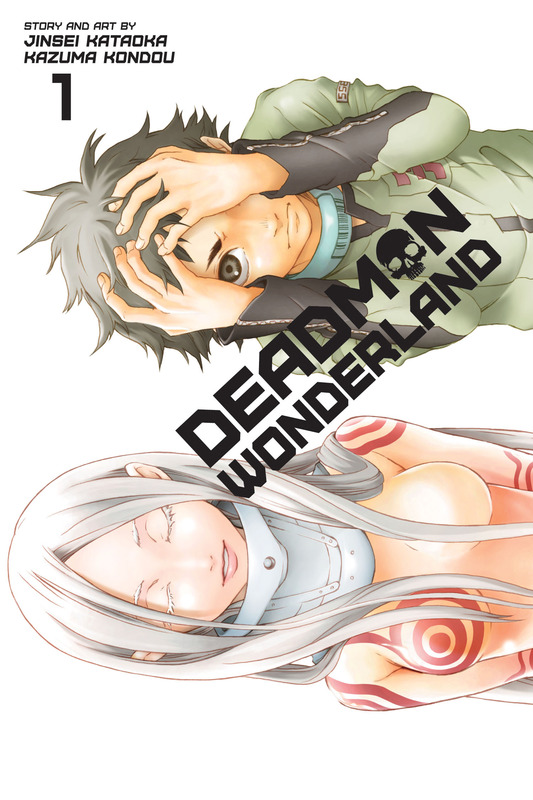 Deadman Wonderland volume 1 was written by Jinsei Kataoka and illustrated by Kazuma Kondou. This volume features the first four chapters (01-04). The story begins with Ganta Igarashii sitting in class discussing the upcoming school field trip to Deadman Wonderland, the notorious prison/theme park. Then, from out of nowhere a mysterious red man appears and instantly brutalises everyone in the classroom. As the only surviving student Ganta is framed and sentenced to imprisonment and death in the aforementioned Deadman Wonderland prison. The difference about this prison is that all the inmates are forced to participate in depraved theme park attractions for the enjoyment of the viewing public, who are entirely unaware of the reality of the prison. Despite his imprisonment, Ganta is determined to prove his innocence and escape this treacherous and twisted land of Deadman Wonderland. My Review: I really love the Deadman Wonderland series, I just think the concept is really cool and I’m absolutely in love with the Branch of Sin weapon. This volume does a great job of setting up the environment that DW is set in. I found that it really builds up the mystery of the Red Man and the particulars surrounding Ganta’s predicament. Not a whole lot actually happens in the volume, were introduced to a few characters and some really cool concepts, I really like the concept of the “candy” preventing the death sentence. The action is somewhat limited, however, there is a pretty exciting race/obstacle course. Shiro seems like she could be a really interesting character, I am really interested in finding out, in more detail, why she is so attached to Ganta and why she is so free in DW. All in all I think that this was a solid start to the series. I’ve considered trying the manga of this because I liked the concept in the anime but the story kind of didn’t go anywhere and then it just kind of stopped.